Four male teenagers were caught and killed by Eritrean soldiers after their attempt to cross the border to Ethiopia illegally beginning this year. This was later reported by a survivor. Eritrean civil organisations and opposition groups called for a funeral march in Frankfurt/Main on February 28, 2009. For the German supporters, Rudi Friedrich of Connection e.V. spoke at the demonstration. 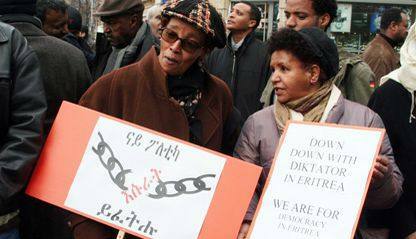 "It is good to see different Eritrean opposition groups coming together today to demonstrate for democracy and justice in their country”, he said. “We are here to support them. We are also here to affirm that refugees from Eritrea need shelter and asylum. Goitom Solomon, Kiros Haile, Tesfai Debessai and Mengistu Gergis were looking for life and they found death. We have to support people who are committed against recruitment and the army, against a criminal regime, people who have chosen life." Please see left for more information.